Jeepers Wally, is it Wednesday already? 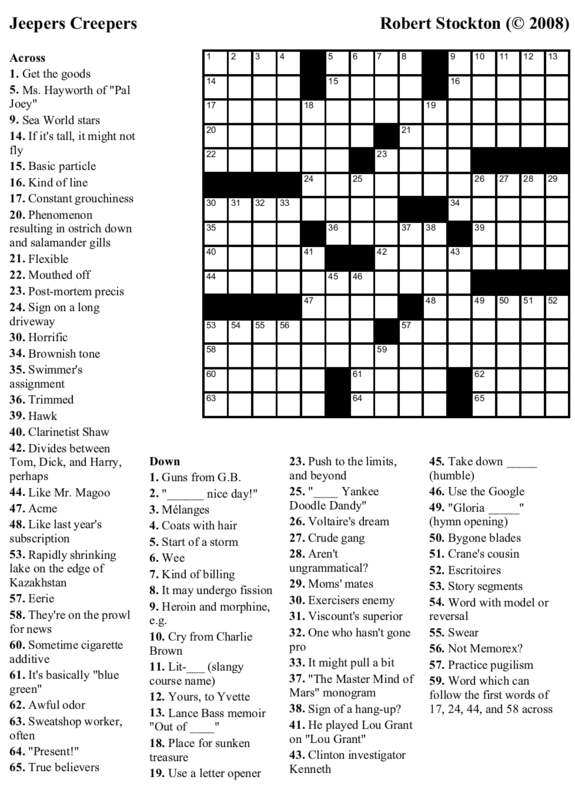 I guess that means that it’s time for another free crossword puzzle, and we’re just the guys to give it to you. All the usual rules apply: You are guaranteed to get a theme with every puzzle. You are guaranteed that there will be no roman numerals or compass directions and a bare minimum of sloths, regardless of toe-count. You are not guaranteed any money back if you are not satisfied, but whaddayawant from a free puzzle. 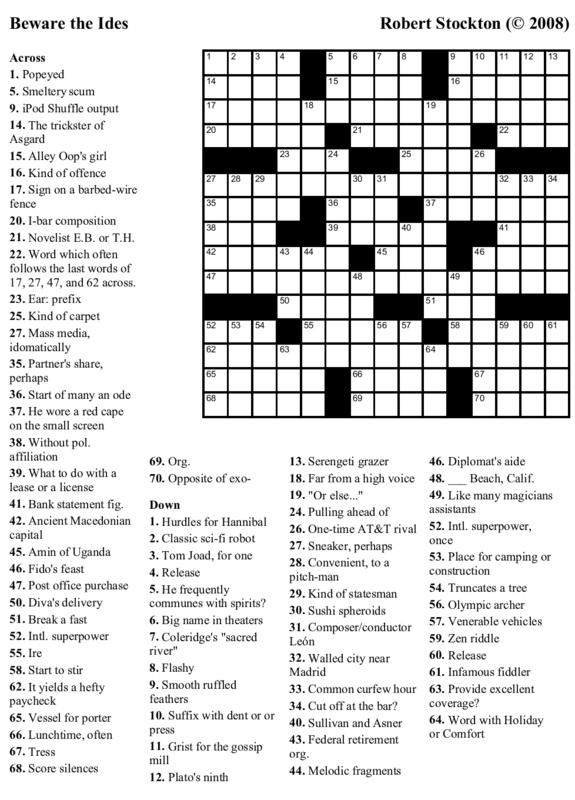 As a special for downloading today, you get the “lite” version, with 20% fewer mistakes in the clues. (We keep our costs down by omitting the professional editor and pass the savings on to you — but our tireless review panel keep us honest.) 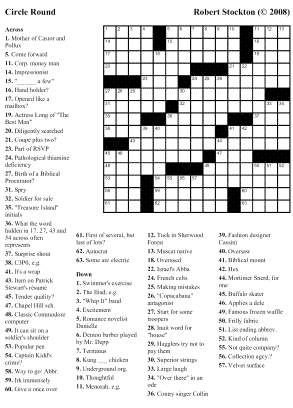 The same review panel has reported that the challenge level of this puzzle sits solidly at “Wednesday” on the NYT difficulty scale. However, YMMV. Look for downloads in the usual formats: either Across Lite or a printable PNG image; and we’ll see you back here next Wednesday. Completely round is the steering wheel that leads to compound fractures. Completely round is the golden fruit that hangs on the orange tree. Yes, the circle shape is quite reknowned. Alter your orbits and circle round, for this week’s puzzle celebrates the purest of all geometric shapes. How so? That would be telling, but if you enter the ring and go a few rounds with this weeks grid, you should be able to figure it out. 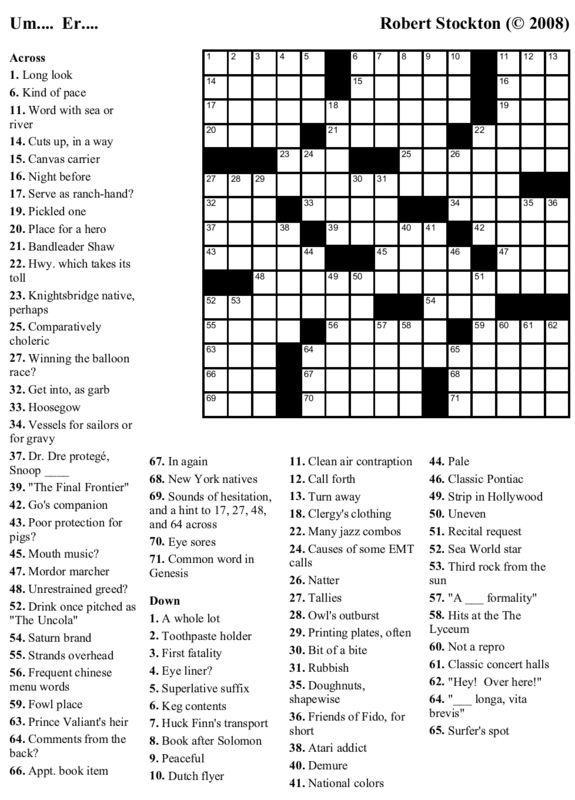 Our panel of experts (to whom we are always grateful) have reviewed the difficulty of this puzzle and confirmed that most clues should fall within your sphere of knowledge, thus putting it at a Wednesday level of difficulty on the classic New York Times scale. 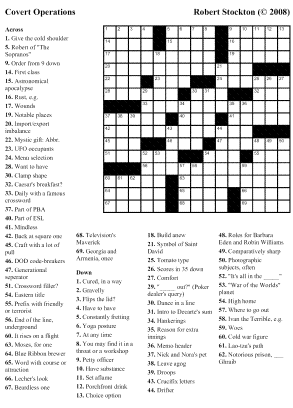 As usual, you can download the puzzle in your choice of format: either Across Lite or as a printable PNG image. Since it’s Wednesday again, you know what your mission is, and it’s far from impossible. 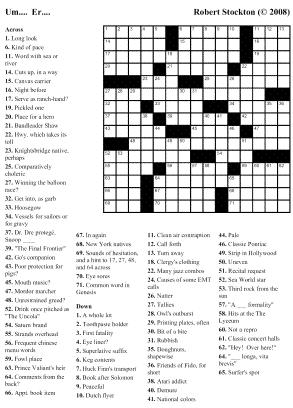 Simply download this puzzle in the format of your choice — Across Lite format or printable PNG image — and solve it at your leisure. If you choose to accept it, you will find that it ranks roughly a “Wednesday” level of difficulty. And, as the man said above, “good luck”. We apologize for the lack of a puzzle in this post, but we want to take a moment to put on our other hats as representatives of Beekeeper Labs, and point out a new page/application that we just put up over on our main site. KnotWize is a nifty little interactive Java applet that lets you create and modify celtic knotwork designs (like the one you see here). It’s colorful, configurable, and free to use — and the designs you create are (of course) yours to use as you like. Make picture frames, cross-stitch designs, or just hypnotic mazes to mystify your dog, cat, or 5-year-old. 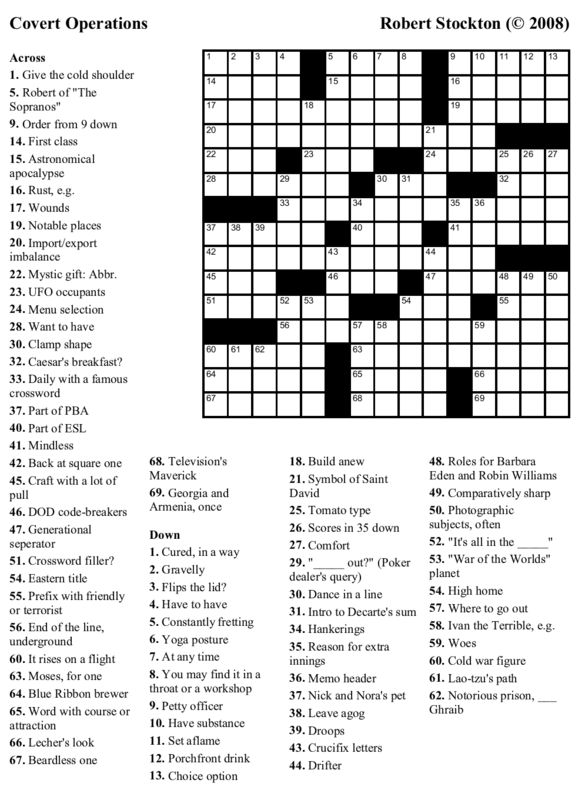 Don’t worry, though, we haven’t forgotten that this blog is supposed all about crosswords — you’ll get your usual fix on Wednesday with no commercial interruptions. 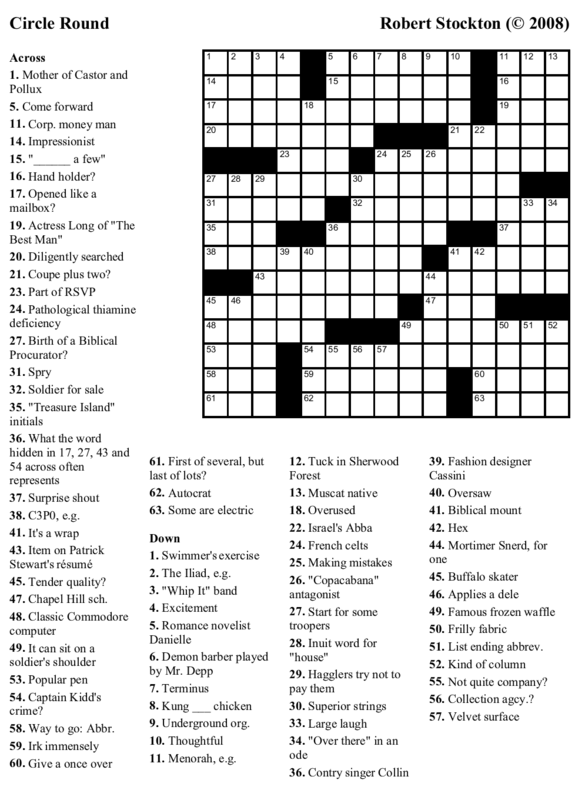 Once again we gather together, pencils in our hands, to celebrate the arrival of a new crossword. Some come with dictionaries held before them, or with the mighty Google toolbar in hand, while others seek to rely upon their wits alone, perhaps unaided by even a simple eraser. Yet all are welcome to join in the feast. 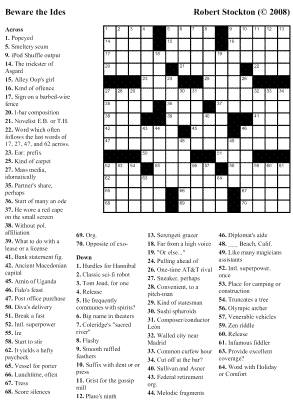 This week’s offering is relatively straightforward, having been rated as a “Tuesday” on the NYT difficulty scale. It can, as always, be downloaded in a choice of formats: either as an Across Lite file or as a printable PNG image. Pick your favorite format, and let the solving begin. Well, here we are again with another new puzzle. What do we have to say about it? Um…. Er…. It’s a puzzle. And it’s new. It’s free, it’s themed, and we figure it runs somewhere around a Wednesday level of difficulty. Beyond that, we’ll let you try it for yourself and draw your own conclusions. 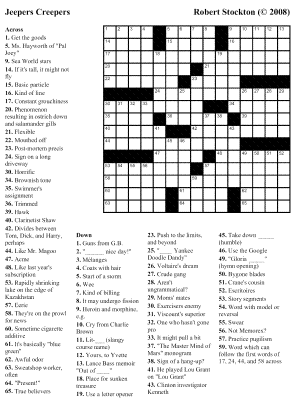 As always, the puzzle is available in two different formats: either as an Across Lite file or as a printable PNG image. Enjoy!